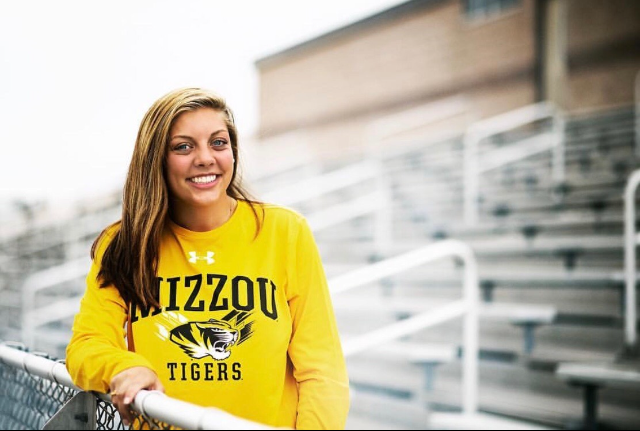 THS alumna Caroline Lemen now attends Mizzou where she is pursuing a degree in sports journalism. Prom Queen, StuCo vice president, link leader, class officer, basketball manager and athlete. According to alumni Caroline Lemen, high school was one of her greater experiences. She enjoyed getting involved and leading. “I learned that it’s cool to be involved; it’s fun to be involved. I met so many different people with so many different backgrounds and stories. It was really cool to become friends with people who I never would have talked to if it wasn’t for that activity,” Caroline said. Caroline said she enjoyed leading groups and helping others. According to former teachers Jim Andrzejewski and her former social studies teacher Charles Baltz, Caroline worked well in groups and was very optimistic. “She always had the ability to keep people on track but also make them smile while encouraging them to make sure that they were getting their work done on time,” journalism teacher Ida Hoffmann said. Caroline took on many roles in StuCo including vice president. She was always trusted, according to Andrzejewski, and always had projects completed on time, and she was great at leading a group. “She was able to adapt when she didn’t always agree with things. [She] was able to understand, compromising a lot, also a great sign of a leader. Besides being a very friendly, genuine human being, she’s just a good person,” Andrzejewski said. Along with her involvement, Caroline was also a great student according to Hoffmann. “Caroline had a great work ethic she always showed a dedication to the class. She was incredibly hard working, and the quality of the product she put out was also very strong,” Hoffmann said. Caroline earned the Samantha Sheddrick Memorial Journalism Scholarship which is only offered to students who plans to pursue a career in journalism. Caroline is majoring in Sports broadcast journalism at Missouri University in Columbia. “No matter what she does, she puts her whole heart into it and gives her everything,” Brooke said. According to Carolines younger sister Brooke Lemen, Caroline was always true to herself. Most who met Caroline said that she was energetic and outgoing. “Staff and students looked up to her for how genuine she was. You never had to worry about Caroline putting any kind of facade on. She wasn’t ever fake; you knew you were getting the real deal,” Andrzejewski said. Now, Carolines a member of Pi Phi sorority and Diamond Crew at University of Missouri Columbia.